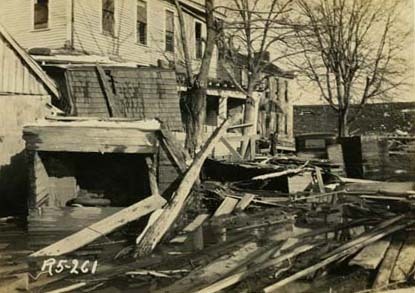 A close-up of J. H. Curry's residence shows significant flood damage. The levee is in the background. On verso: "Curry was owner of largest lumber yard in Shawneetown." “J. H. Curry Residence,” Chronicling Illinois, accessed April 24, 2019, http://chroniclingillinois.org/items/show/27917.